A snow-white egret stood silently in the shallows off a bank of the Cooper River as a blue heron dipped below the tree line and flew west. Nearby, a bald eagle took flight and crossed the water, gliding on arched wings before landing somewhere in a cluster of treetops. Just beyond the forest was Camden High School, and the constant traffic on the Admiral Wilson Boulevard. But all was quiet as a phalanx of canoes paddled down the river early one morning this week, manned by five teenagers from Camden and others who came to explore the hidden world that flows through the heart of the city. "I had no idea this was here," said Jarimar Nieves, 16, one of five teenagers who took part in UrbanPromise River Guides, a course created this summer to educate local students about biodiversity, water safety, and local history. "The first time I went out on the water, I thought it was pretty beautiful. Then I saw the birds. Now, it's a whole new way of looking at Camden." Funded by a grant from the William Penn Foundation, the 10-week course is run by UrbanPromise, a nonprofit Camden organization that operates a variety of summer and after-school programs as well as two private schools. 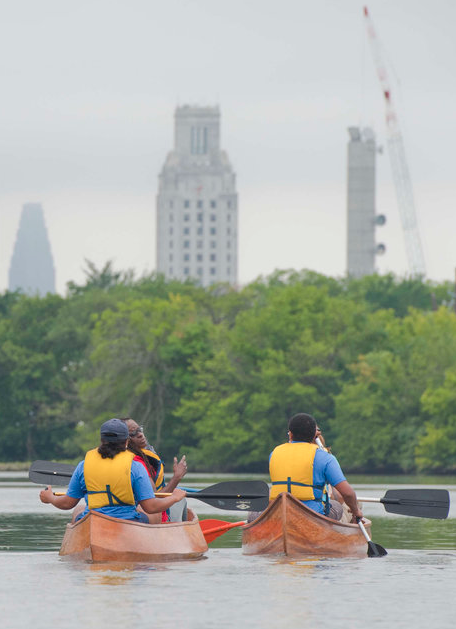 All summer, three UrbanPromise Academy students and two recent graduates who now attend college have learned how to test water samples, conduct water rescues, and repair boats and canoes through a Boatworks wood shop, and lead ecological tours. The student-guided tours are finished for the summer, but Victoria Carberry, the environmental educator who runs the program, said there may be additional paddle tours open to the public later this year. The student tours will return next summer, said Carberry, who hopes the program will expand. "We're really trying to improve access to the river and trying to make this a place that people can enjoy," she said. "People don't think of the Cooper River as a natural resource, but it is, and it's a wonderful one." On Wednesday morning, the five teens were joined by volunteers, UrbanPromise staff, a few parents, and a few city residents who had signed up for the river tour. The boats go in near the Kaighns Avenue Dam, close to the Pennsauken town line, and conclude about 2 ½ hours later in North Camden. 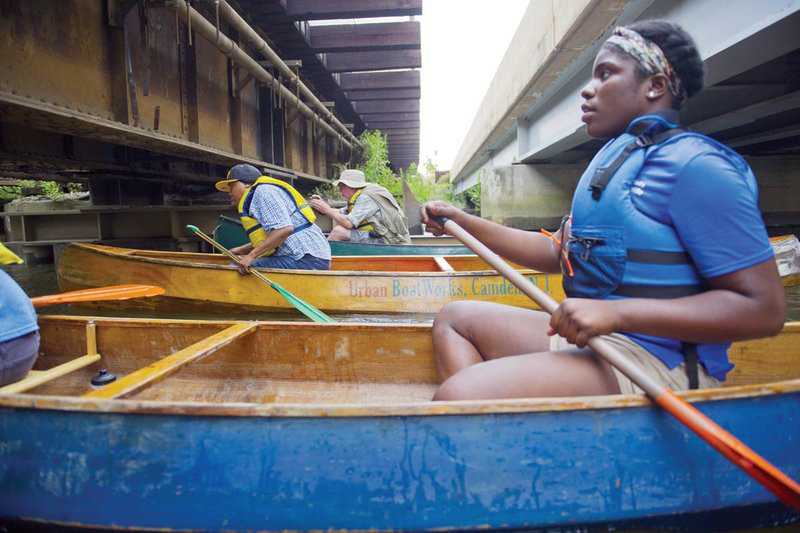 Guided by the tides, the canoes made their way down the glassy surface of the river Wednesday, passing beneath bridges and railroad tracks that connect East Camden to the rest of the city. As the boats glided beneath the Baird Boulevard bridge, a man walking across the overpass stopped to wave. "Hello!" he called out, and the kids waved back. "Good to see all of you!" As the boats moved into Farnham Park, guides explained that the riverway was once a thriving neighborhood park with a swimming pond, picnic pavilion, skating rink, and more. 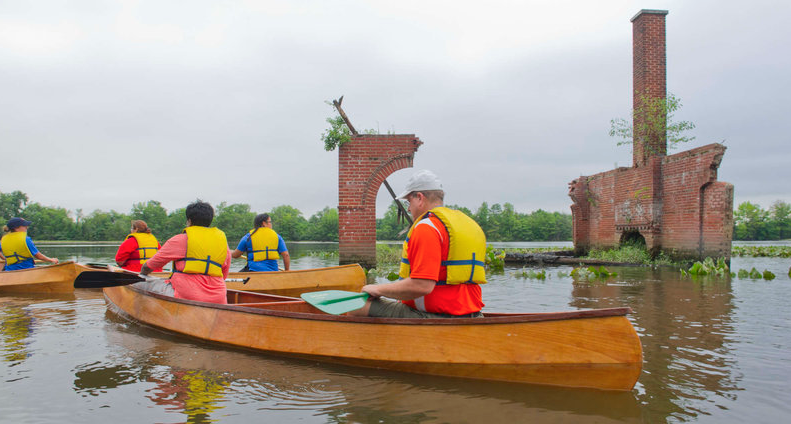 But flooding caused by 1972's Hurricane Agnes overtook the area, and now all that remains is a brick wall with a chimney rising from the deep water. The isolation has made it a haven for shorebirds. "The fact that they're here means that something good is going on with this ecosystem," said Jeff VanderKuip, director of the Boatworks program in Camden, which teaches students boat repair and woodworking. The tests have revealed that the water is cleaner than people might expect, Carberry said. Beneath the surface are carp, catfish, and freshwater mussels. "You wouldn't believe you're in downtown Camden, would you?" asked Andy Field, a volunteer with the program, as the tower for Camden City Hall came into view. The Cooper flows past Campbell Soup Co. headquarters and the future site of Subaru of America before it flows into the Delaware River, from which parts of the Philadelphia skyline come into view. It also passes a former marina, where boats have been abandoned to bob in the water, before the tour ends behind the baseball field at Pyne Poynt Park in North Camden. Veronica Johnson, a lifelong Camden resident and volunteer for UrbanPromise who joined the tour, said Wednesday was the first time she had been near water since 1969, when someone pushed her into the Centerville pool. But she enjoyed the river tour so much she might try to go again next year. "I said, my God, I'm in a different world!" said Johnson, 59. "I know it's Camden, but it seems like Hawaii or Jamaica. It was that beautiful." For more information about the paddle tours, email Carberry at vcarberry@urbanpromiseusa.org. For more information about UrbanPromise programs, visit urbanpromiseusa.org.